Our autopilot, a.k.a. the mouse, does us well once again. It’s the third crew member that is key on passages. While underway from Toau to Papeete we experience again how valuable our setup is: waves coming from port-aft and port-forward, 30kts of wind and Jade Akka in motion, our autopilot does his job reliably while I am writing this. Isa is having a nap in the skipper berth just besides me in the pilot house. I am trying to hold on to the laptop. And the mouse is heading us to Papeete. Resting is so important while under way, and only the autopilot frees our time to keep orderly rested. Waves bash to our port side. Bang! Spray blows across the cockpit. The dinghy is hard to secure. But down in the pilot house it’s comfortable, warm and dry. The big hydraulic ram moves the rudder back and forth as the pilot computer balances movement, wind pressure and heading. As we have a continuously running hydraulic pump, we only hear the hiss of the oil in the pipes when the solenoid pressurizes the one or the other line. The micy noise gave our autopilot his name: the mice. Way to early we reach Tahiti. It’s night, entry over the reefs might be an option but we do not want to take the risk. As we have never drifted with Jade Akka before, we try this in 20-25kts of wind. Well reefed, we heave to. And still make 1.5-2.5kts. However, we sleep sound, just interrupted by checking the situation every hour. Anything around we could bump into? Sails and wind still stable? Dinghy fixed well? Radar showing targets? Any annomalies? No? Then back to bed! Early in the morning we furl in the headsail, pick up speed and tack towards the island. The winds are still on and we drifted quite a way. So we speed slightly windwards with 8-9kts. Captain Tom enjoys the speeding. We do not allow us that pleasure too often, as it takes a big load on the rig. But this time it’s just too early in the mnorning to be patient, the conditions, though 2m waves, great and the views on Tahiti and Morea cool. So we bounce through the morning squalls into Venus Point anchorage, where we drop the hook into the black sand and go to sleep for a few hours. Marrion is here already, and we have breakfast together. Marta made scones, Isa bread and Travis and I handle the dinghy so the ladies do not have to work on that. All settled, we head to town by dinghy for a first glimpse. Our expectations are high: we have not been to „town“ for quite a while now. No real internet for months. No latte macchiato in a coffee shop. Only few people around. No hassle. So we are prepared for a change. We find Papeete quiet, with all supplies needed, especially in the Carfour Supermarkets, but not super busy, not at all crowded, rather a bit sleepy. As the Tahiti Morrea Sailing Rendez Vous is taking off to Moorea, we sail to town and into Marina Papeete to be close to all the urban goodies and boating chandleries. The marina is super nice, very affordable and right down town. And indeed, we find a spot to tie down. We have a fair internet connection at the marina’s little hang out place (with an air conditioned room for those that like it - we prefer to be outside). To keep stress at bay we have an engine mechanic mounting the new coolant pump that Daniel brought from home. The old one had a little play in the bearing as the Mexican mechanic had pointed out. It was not bad and for sure we could have gone on with the old pump, as we find after dismounting it, but the new one lowers the risk of a sudden death massively. So we go exploring the city soon and also rent a car to tour around the island. Compared to the Marquesas & the Tuamotus the Societies seem to be a mixture of both with way more rain: a surrounding reef and steep mountain ridges with some cascades. Lush greenery and the island-style homes remind us of Hawaii - at least we think it must look like that in some areas. The city is relaxed but still busy enough to provide anything needed in the islands. So we hang out, enjoy Italian-style espressos, good ice cream and walks on steady ground. We find fancy stuff at the Belvedere restaurant: high above the city on a ridge they convince us that the modern gastronomy has found its way to Polynesia. Not only the infinity pools is impressive besides the view, but also the fancy restrooms. They would easily compete with the top-notch-Zurich-style restrooms at home. However, after a week we decide to head on, as we do not want to extend the marina and we leave for Moorea and the rest of the Societies. The sail over to Moorea is short, but turned out heavy. We hardly had set all our sails full size as I look back and see massive clouds approaching. Warned from the last passage, I assumed the wind to increase sharply. With 20kts predicted, a little more actual, this would make probably 30kts. It turned out to be 40kts. Right on our back. Full sails up. Bad moment. And indeed the wind increased before we had the main reefed. Not a problem, but reefing in 40kts from full sail to 3rd reef in heavy rain is more challenge than fun - but still a bit of fun. Well reefed we made our way to Moorea, accompanied by squalls and welcomed by heavy, heavy tropical rain. We lost sight of the island just a half a mile off the reef. Trusting the charts and the GPS we headed into the pass under engine. Luckily the wind died close to the island, so we only had a nasty rain to manage. The Societies are well charted and the buoys are lit reliably. Being in our situation we were comfortable. However, we thought of the early sailor cruising this area. Loosing sight of landmarks would mean heading straight back to sea, away from the currents and reefs in proximity of the islands. Today, it’s kids play compared to the time with inaccurate or no charts, no satellite based navigation and no moving maps on the chart plotter. We dropped anchor in the designated area in one of the famous bays of Moorea and had a rest. The rain and wind took their toll and we wrapped ourselves in towels and warm clothes. Tourist attractions are tourist attractions. They are interesting and attractive. But they so often are slightly queer. In Moorea we went to swim with the stingrays. And yes, they feed them to have the resort guests get their adventurous shots of wild animals in front of their luxury over-the-water bungalow. The expensive camera equipment needs to be used at least once - how could we otherwise justify shopping and disposing of all this super sophisticated goodies? So we dove in the shallow water with other tourists taking pictures with expensive equipment, trying not to get in their pics while shooting our own pics - while also remembering the sharks we had all for ourselves in the Tuamotus. Where there is food there are the sharks. So don’t expect to see the stingrays without the ubiquitous black tips. Tourist attractions have something on their own. It would be sad to have missed this. 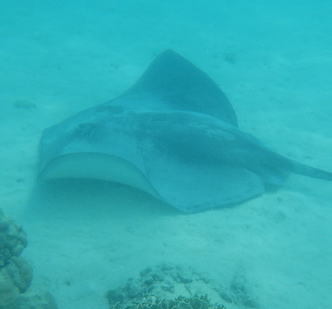 Especially as one of the big stingrays sneaked up on me from behind. It’s one thing when they effortlessly drift under you belly and suddenly appearing in you field of view. It’s another thing when these creatures decide to feel your skin while standing in the water. They for sure do not let you know in advance. 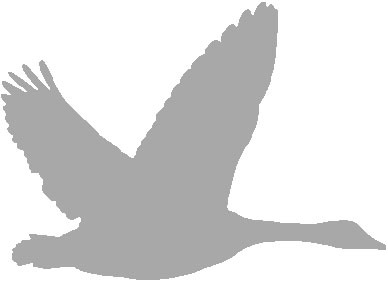 You just feel that soft thing on your back … turn around slowly in these waters, you do not want to scare them. We will remember this tourist attraction for sure! However, a good weather window called for an overnight passage to the next group of islands and we left the next day for Raiatea / Tahaa. Slightly rolly and with strong 20kts of wind we sailed over to Tahaa. There we dropped anchor in that picturesque lagoon. It looked like you want it in your holiday prospectus. Seven meters over sand Jade Akka rested short behind the reef, just beside a nice little motu and a pass to snorkel. Luckily Merrion appeared soon on the horizon next day and we were diving the corals and drop off in the pass. Wonderful. However, hardly and bigger fish to spot. So unlike the Tuamotus, we returned without fish from our expeditions. Though with great memories in our minds: overhanging corals down in 10m depth and the blue sea, light breaking above us. Just like Anse Amyot, but without sharks. Raiatea provided us with some spare parts. Not only for the boat but also fishing equipment. And we provisioned another bit. By chance we bought a big piece of meat that turned out to be Merrion & Oso’s good bye dinner. They had to leave French Polynesia and headed out for Tonga. We will go a bit later, visiting Bora Bora first. With a little delay the local yard, a.k.a. Carenage, finished our custom bow roller (for the third of the price they offered in Papeete) and we also crossed the reef and set sails for Bora Bora. Rain and squalls followed us under way. Wind was great and progress quick. So short before reaching Bora Bora’s reef we decided to see if Jade Akka could match another modern medium displacement sailboat of similar size. The boat had been in sight for a while, going slightly closer downwind. Right ahead was a bend in the reef where all boat would have to turn around, so we tried to get them before the rounding. Unreefing was done in a few minutes and we optimized the sails to perfection. In the wave of the other boat we turned north towards the pass of Bora Bora. Broad reaching we took pictures as people dream of: the rough peaks of Bora Bora with a white sail in the foreground, the turquoise waters and breakers somewhere in the middle. Bora Bora turned out unspectacular for diving (given we were in the Tuamotus before). But as we stayed at anchor downtown, we heard the songs and drums of the Heiva festival every day. Of course we wanted to see, not only hear, the locals performing. And it was a blow. Singing, dancing, drumming. Huge groups. Fancy dresses. Colorful. Loud. It gave us a feel of how a man-eating-feast might have started. It must have been startling for the first Europeans. For now it was peaceful. A competition across islands. Sometimes including also the special Coconut bikini - but mostly appropriately conservative Christianized (another question if this is an improvement or to what degree). So we spent three evenings watching the competition, wandering the venue and it’s palm leave covered restaurant „huts“ and roulottes. Of course we also tested the food in one of the restaurants. As we were early, we had the ukulele band for ourselves. The roulottes, small ad-hoc places with vans as cuisine, served wonderful local fish, or rather ordinary steak et frittes. With our cruising company we checked them out frequently. Together we also approached the rocky summit. However, the muddy steep trail was not of our liking and Isa and I turned back after two thirds. Other cruisers from Barefeet (Australia) and Adagio (US) together with our guest Kurt went to the top, enjoying spectacular views over the lagoon. Preparations for the next crossing took some time, too. Another mast top visit was necessary to exchange the main halyard roller. We checked the furlers, sails, engine, watermaker etc and found only minor repairs to do. So we went forward to do the non-glamorous check out procedure. The Gendarme handed us the forms to fill in with a little crooked smile - he knew it was a bit a pain to fill in the same information onto different forms. However, he was super friendly and helpful to get us through. So we are optimistic to leave in a few days for Tonga, too. A little snorkeling, some hiking and ice cream in the Bora Bora Yacht club held us busy before the final provisioning. Then we got clearance as requested. We set sail to get blown through the pass and onto the big blue Pacific. A little note on hiking in Bora Bora and French Polynesia: look for trails on the east side. The trail in Bora Bora left in the main town, just besides the Eurocar rental shack. It goes east until it zig zacs up the steep slope. However, the rainfall on these islands hits the west coasts. The east slopes are usually dry. So if there is a trail from east towards west, or north to south as it might also be in Bora Bora, try this one first. It’s more secure than climbing muddy rocks holding on to vegetation and occasional ropes of unknown quality. Anyway, it’s worth the try!